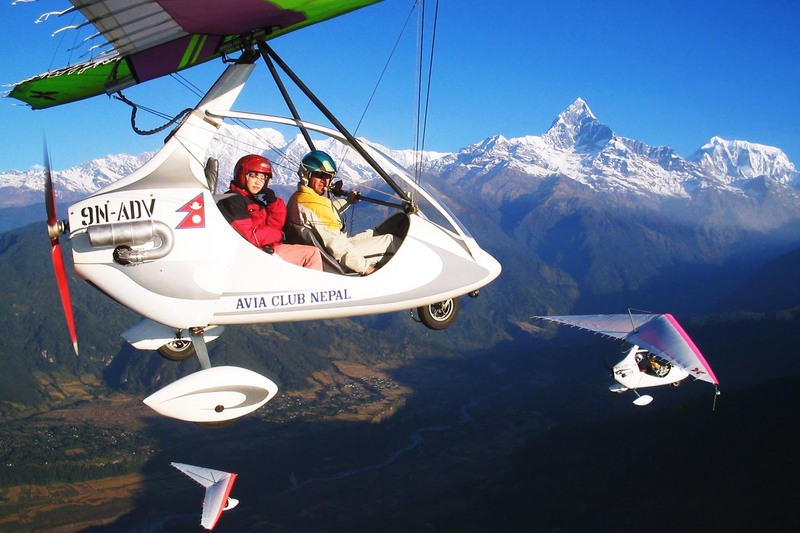 Ultralight Flight aircraft is another medium to observe the full spectrum of the magnificent Pokhara valley along with mountain peaks and lakes at the same time. Ultralight is a very light aircraft that has no window and seating for only two persons, including a pilot and a passenger. Powered by engines these aircraft can reach very close to the mountain peaks. Flight Covers: Sarangkot, Phewa Lake, Peace Stupa, Seti River, Power House and few other stops of Pokhara valley. Flight Covers: Mt. Fishtail Foothils, Sarangkot Circle, Naudanda Hill and few other stops of Pokhara valley. Flight Covers: Panaromic View of Annapurana Range, Mt Fishtail Foothills, Sarangkot, and few other stops of Pokhara valley. Flight Covers: Panaromic View of Annapurana Circle, Mt. Manaslu to Mt. Dhaulagiri Range and few other stops of Pokhara valley.